The Write Question is a weekly video podcast all about writing. 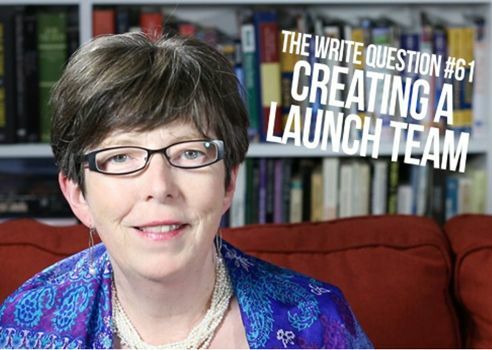 Today’s question focuses on how to assemble a book launch team. If you have a question you’d like me to answer, email me at daphne@publicationcoach.com, tweet me @pubcoach, or leave a message for me at the Skype account, The Write Question. Welcome to The Write Question, I’m Daphne Gray-Grant. Today I’m talking about how to assemble a launch team for a book. I have a question from reader Christine Currie who is based in east Missouri. Here’s what she’s asked. Thanks for the question, Christine. I’m glad you’ve asked me this right now because I’m getting close to completing the editing of my own next book and I need to be thinking about a launch team as well. First, let me give some definitions for those who are unfamiliar with the terminology. A launch team is a group of 50 to 100 volunteers who agree to share your book with their own networks and help you promote it. Sounds simple, right? Before you start, there are some things you should keep in mind. Don’t start forming this team too early. Otherwise, people are likely to lose their enthusiasm. If you are just in the first edit of your crappy first draft, it’s too soon to start contacting these people. Sure, think about your launch team. Make plans for it. But don’t do any talking about until you are four to six weeks before your release date. Create a list of names. This might start with family and friends but it should also include the names of people who’ve bought previous books from you. Or it might even be a subscriber list if you have a website that collects emails. To get 50 to 100 readers you probably need to invite five to 10 times that many people so you should be looking for a list with a minimum of 250 to 1,000 names. That’s a lot, I know! On the other hand, if you do have a really big email list, consider ways of winnowing down the numbers. You might want to ask applicants a bunch of questions to try to figure out the best matches for you. Or, alternatively, you could make it a random draw. By the way, you might want to send your invitation as a video, if you have the means to produce one affordably. I’m including a link on making videos in the description below. Next, create an ongoing way of communicating with your team. You could use a Facebook group if you like or set up your communications via an Autoresponder, if you have one. (I use Aweber.) Or just make it an email list. The main item you need to give your team is an advance copy of your book. Make it electronic if you like but if you’re able to send them a print copy, be sure to write their name on it and sign it. It might also help your team to have an exclusive webinar or group call with you and VIP access to your book launch party, if you’re having one. The team will also need some concrete suggestions from you about how to promote, ideas for tweets and where to send reviews. Also, be sure to keep in regular touch with your team so they know how you’re doing and they stay motivated. Creating a launch team is a fair bit of work, Christine, but it’s worth the effort because it’s going to reward you with increased sales. As authors, we’re sometimes shy about the necessity of self-promotion. But if we don’t have any readers, what is the point of our writing? Get some help in rounding up more readers, Christine, by calling upon your own custom-designed launch team.